You may have heard it all before, but it’s always good to be reminded of ways to stay safe in the sun. The sun’s UV rays are strongest between the hours of 10AM and 4PM so it’s a good idea to limit your exposure during these times and stay in the shade as much as possible. While recommendations for sunscreen vary, on average, you should wear a minimum SPF factor of 15 with “broad spectrum protection” (protects against both UVA and UVB rays). Apply sunscreen evenly and liberally over exposed areas (including neck, ears, lips and and exposed scalps) and reapply often if swimming or sweating. 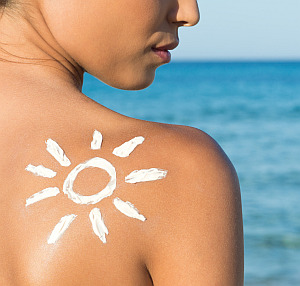 > Check out What’s Your Best Sunscreen? at WebMD. Strut your stuff in a wide brimmed hat, some snazzy sunglasses with UV protection, and clothing that covers your arms and legs. However, you don’t have to cover up and look like a mummy! > Consider styling with a UV protection umbrella. There are many, cool styles for women, children, and men! And just for fun, take a peek at The Gentleman’s Guide to Umbrellas. > There are wonderful clothing lines, such as Coolibar, with fashionable items that offer UPF 50+ protection and block 98% of UVA and UVB rays. > Tip: Some UV protection clothing and umbrellas are quite luxurious with prices to match! Try searching on Amazon and eBay for deals. Of course, check your skin regularly to know your “normal” and to be able to identify any new growths, changes, or discolorations that may need medical attention. With the Zika virus at the top of the news, it’s important to know the risks and take precautions for safety. Mosquitos that carry Zika virus bite primarily during the day and can also spread dengue and chikungunya viruses. No vaccine exists to prevent the Zika virus disease and many people don’t even know that they’ve contracted it! The best way to prevent the Zika virus is to avoid mosquito bites. 1) Make sure that all of your doors and windows shut tightly and have screens. 2) To keep mosquitoes from laying eggs inside your home, regularly remove all sources of standing water (where mosquitoes also breed) on your property including flower pots and saucers, toys, rain gutters, and pet bowls. 3) Wear insect repellent containing DEET, picaradin, oil of lemon eucalyptus or IR 3535 to prevent mosquitoes from biting you. If you are sensitive to chemicals, try a more natural approach (such as citronella oil), but investigate your options with reputable sources and read several testimonials to get ideas. Mosquitoes usually bite in the early morning and evening so it is important to wear repellent at those times. 4) When outdoors, wear loose, long-sleeved shirts and long pants because mosquitoes can bite through tight-fitting clothing, especially if the fabric is thin. For more information on controlling mosquitoes inside and outside of your home, check the Center For Disease Control’s website. Marijuana and Opioids – The National Organization for the Reform of Marijuana Laws notes the differences between the drugs. This entry was posted in News and tagged DocTommy, DocTommyO, Dr. Thomas G. O'Brien II, Medical Marijuana, New York, news, summer, sunscreen, tips, Zika virus on May 25, 2016 by Goddess Projects.